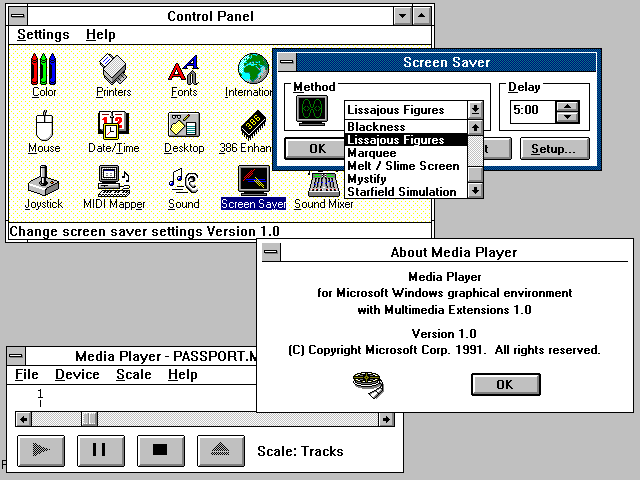 Before the release of Windows 3.1, Microsoft created an expanded version of Windows 3.0 that included "Multimedia Extensions". This version appears to have been released to manufacturers only and not sold as a standalone product. This release has a different startup screen. Instead of just "Windows 3.0" it reads "Windows - graphical environment with Multimedia Extensions 1.0". 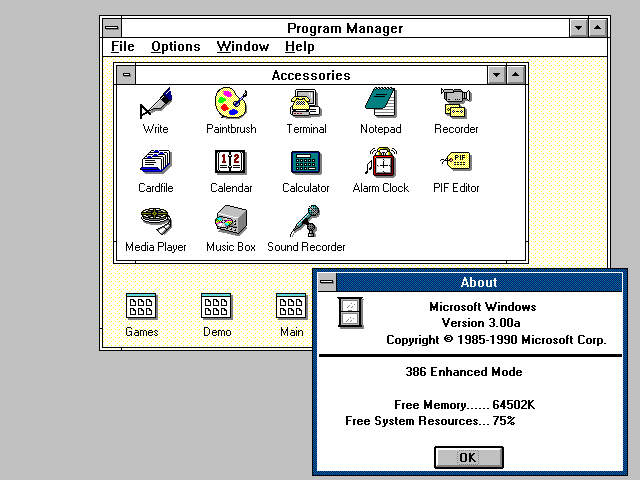 Once you get in to it though, you can see it is the same Windows 3.0 software with nothing changed except for the addition of several new applications. Windows 3.0 could run on an 8088/8086, but this version requires a 286 or higher. Technically Windows 3.0 MME will still start up, but all of the new multimedia extensions, and even the screen savers require 286 or 386 mode. 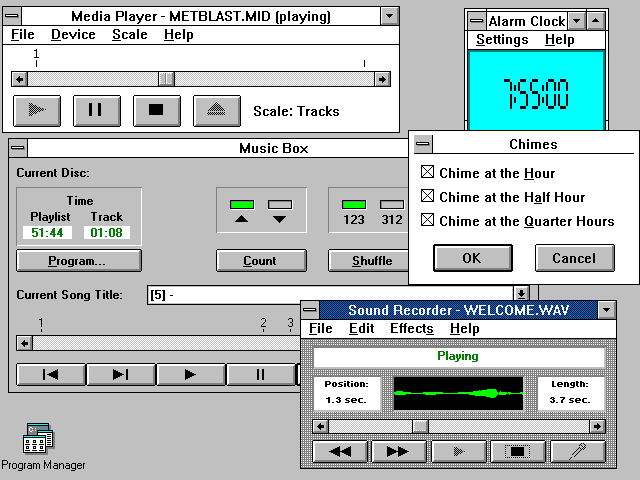 The new applications are Media Player, Music Box (a cd player), Sound Recorder and a new clock. These applications only work if Windows is being run in standard or enhanced mode. And this version includes screen savers. Ooohhh, pretty! Two screen savers are included that I had not seen before. 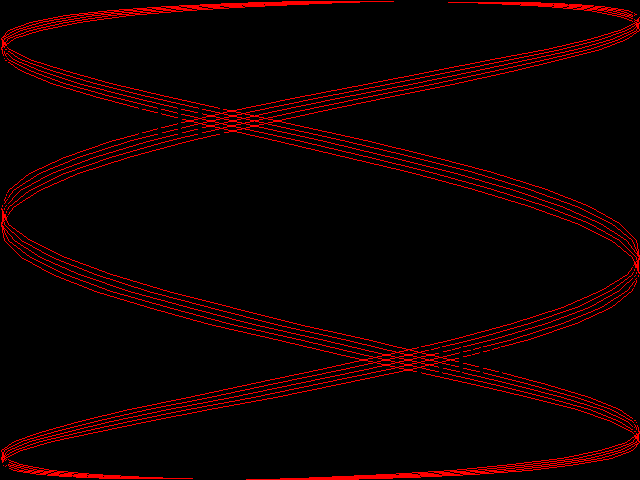 The one shown above called "Lissajous" that shows random curves and sine waves, and one called "Melt" that makes the desktop appear to melt downwards. It also includes the Marquee, Mystify, Star field, and Blank Screen screen savers. 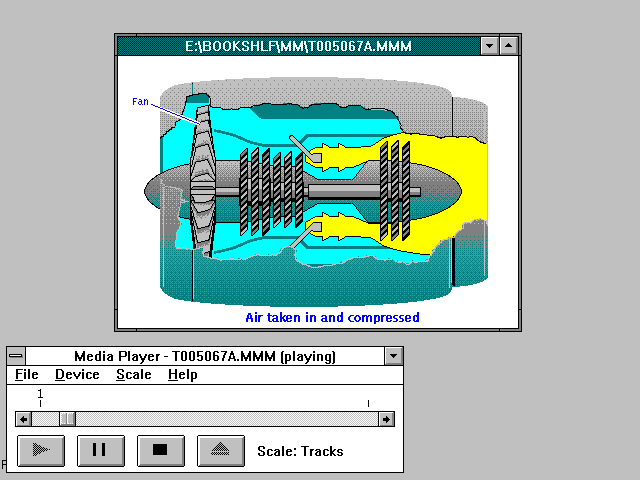 The media player is capable of playing ".mmm" animation files and can be extended to play other formats. Applications can call the multimedia subsystem directly to display animation directly without the media player shell. This screen shot shows the control panel. It has been expanded to include additional control panel items. 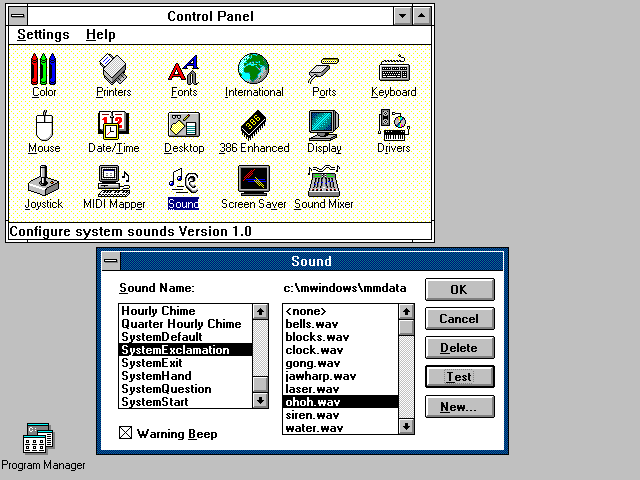 The original Windows 3.0 control panel was a fixed size dialog and could not incorporate more control panel items. Display - for selecting different resolutions. Drivers - add and configure multimedia drivers. Joystick - for calibrating the joystick, if present. MIDI Mapper - for mapping instruments to midi devices. Sound - (shown above) - lets you specify startup and other sounds. Screen Saver - for changing the screen saver and any settings. Sound Mixer - this is part of the sound driver that happens to be included with this version. 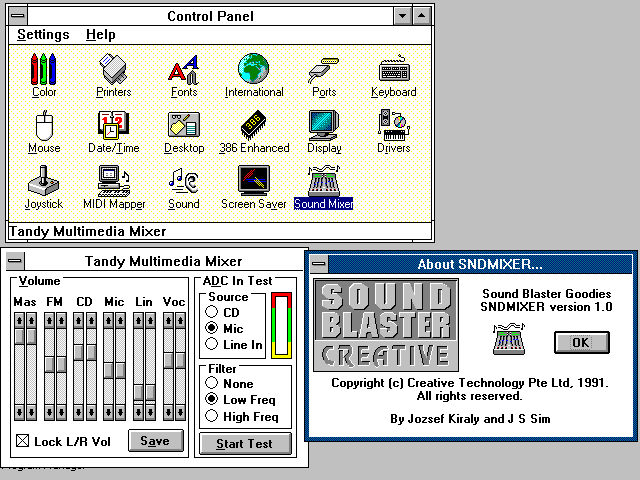 The sound drivers are provided by the computer manufacturer, in this case Tandy. These drivers are for a Creative Labs Sound Blaster series sound card. At the time Sound Blaster cards were very popular and were supported by a huge number of DOS games and applications. 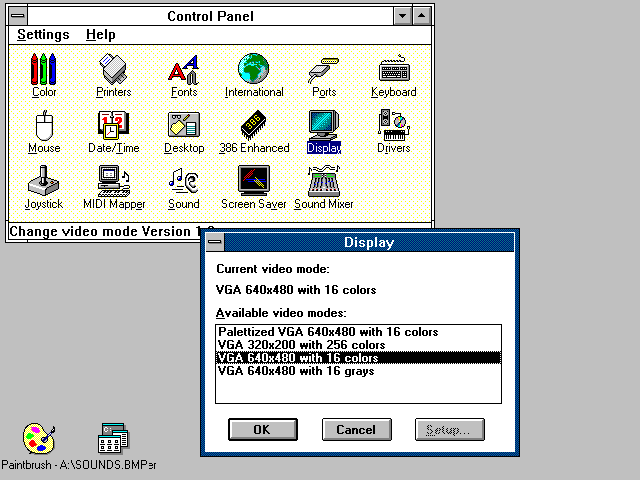 This version of Windows includes several additional video drivers that support 256 color modes. Interestingly it even has a 320*200*256 graphics mode that runs on generic IBM VGA hardware. In this version the screen savers are a separate control panel item. 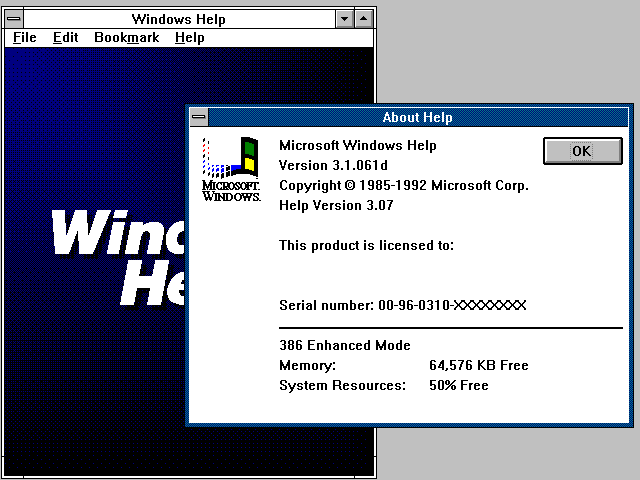 One final interesting note: The winhelp help system is upgraded with a newer version that appears to be from an early version of Windows 3.1.